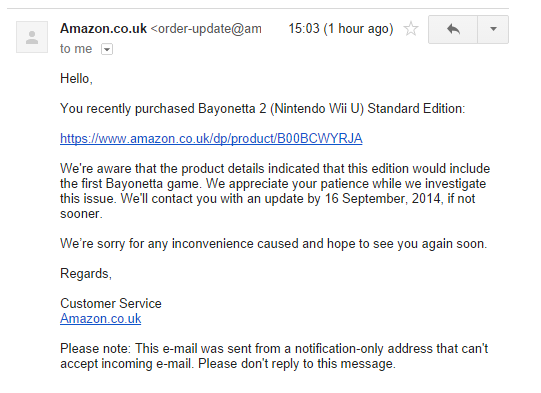 What’s Happening With These Bayonetta 2 Orders From Amazon Then? Amazon put a listing on their website saying that if you agreed to give them £31.85, they would agree to give you a copy of Bayonetta 2. They also said that it would include a copy of the original game too. Quite the deal. As such I told you lot about it, hoping that the cycle of production and consumption could continue uninterrupted. Amazon had other ideas in mind. See, Amazon UK’s original listing of Bayonetta 2 was based on information given out by Nintendo of America, and the situation for the UK is subtly, but crucially, different. Outside of Europe all copies of Bayonetta 2 include the original game at no extra charge. In the UK, the standard edition of Bayonetta 2 does not include the original, it’s only included with the more expensive “Limited Edition”. Amazon had put incorrect information on the item description for Bayonetta 2, information that customers (reasonably) will have taken at face value. Some time after Nintendo publicly confirmed the plans for the EU launch of Bayonetta 2, Amazon changed their listings. They added a totally separate listing for the Limited Edition, and erased any mention of the free copy of Bayonetta from the existing listing. I don’t actually think it’s a huge deal that Amazon accidentally listed incorrect information, these things happen, and it’s hard to keep on top of the specifics of exactly what a video game promotion involves, especially when dealing with Nintendo’s byzantine operations. But how Amazon have dealt with the fallout of their error has so far been a total omnishambles. I’ve heard from a range of people who ordered this, and everyone has a different story about their experiences. I’ve heard some people were offered a free upgrade to the Limited Edition (matching what Amazon actually promised would happen prior to them updating the listing). I’ve heard some people get some kind of gift voucher to make up for the mistake. £5 in some cases, £15 in others. I’ve heard some people told they’ll get nothing. They lose. Only option is to cancel the original order or accept not getting the promised copy of the original at no extra charge. Personally, I spoke to their livechat, and mentioned that their twitter account had confirmed I would get the original, only for their livechat lie to me, claiming that Amazon don’t even have a twitter account. Utterly baffling. I followed up with them on twitter and got a £15 gift certificate for my trouble. I’m not really sure what to expect, or what the best course of action is. Probably hold on to your orders for at least another couple of days to see what they come up with. If you managed to get a response from Amazon, positive or negative, perhaps share it in the comments to help other people decide how to proceed. Sorry it didn’t go as smoothly as I’d have hoped. I got in contact with amazon through their live chat. Told them what has happened and so on. First they tried to put the blame on me, as I selected the incorrect edition of the game. After telling them there was only one version at the time and it said it included the original, they told me just to cancel my order and place a new one for the limited edition (with no discount or anything). So I told them ok I will cancel it but I’m not going to place a new order because the price is too high. I then asked how do I go about canceling my order if one of the items on my order has already been shipped (I ordered 3 different Wii U games). They said they would do it, and after a while they were unable to cancel it. So they told me to wait until Bayonetta 2 gets dispatched then call them so they can call the courier and cancel the dispatch. Like what the hell? That’s not how things work in Amazon, and I know because I worked for amazon. Unless they actually come up with a good solution (as in include the game), I will cancel my order through that messed up way they told me. If people are chatting to Livechat, it might be worth angling for £15 Gift Vouchers. You can link to tweets saying other people have got that amount, and it offsets the extra cost of the Special Edition, so you’re not actually out of pocket. I’m debating what to do, personally… I think my idea above will work, but… It’s Livechat, man. I’ve spent all day at work, why should I have to do more work when I get home? Hi there! I managed to get lucky and got the Special Edition (Bayo 1+2) for the original price (32GBP) via a nice livechat rep. I asked nicely for help with the confusing situation trying not to be rude and explain the whole process of product description, announcements and prior communication very clearly so I was told to cancel the old order and place a new one for the Special Edition which the CS rep then fixed the price to reflect that of the original order. This was probably the ideal/best case scenario. I went to amazon’s live chat the moment i saw someone get upgraded through Lewie’s retweet. After explaining the situation the staff member seemed to understand the situation and said that if i let her cancel my old bayonetta 2 order, and ordered the special edition afterwards myself (she said she wasnt able to actually create orders, but she could edit them) she would then adjust the price to £31.85. Sure enough, after i made the second order she fixed the price. I was on livechat on Thursday and was told that they could cancel the order for the standard edition and create an order for the limited edition, but at the full £47 price. I was told that their policy wasn’t to upgrade orders and that this was the only thing they could do for me. I had mentioned that other people had been upgraded or compensated, but they said they knew nothing about that. I spoke to three people on chat due to dodgy wifi ( everytime my wifi reset i had a new person). First two just read the product description and said it was the standard one. Last one took a long time to check with the internal team and came back saying they’d know by the 16th I suspect a lot of people have been asking. Might get a pre-order in at Shopto in case. No joy from Amazon for me. They were absolutely steadfast on not including Bayonetta 1 with Bayonetta 2. I was polite and the person I spoke to on live chat certainly took their time checking things with someone a couple of times when I posed questions. They also said that they are unable to comment on what other customers have received so mentioning that to them didn’t help me any either. It’s a shame but pretty much what I expected. This is strange. All this is unworthy of Amazon in fact. I ordered the game and I was automatically upgraded to the Limited Edition. I don’t know why they haven’t done the same in every case. I didn’t even have to send them an email asking for an explanation. They upgraded the order directly. I thought this was the case for everyone, but now I see I was wrong. I’m totally freaking out with Amazon. Seems I am not getting the Special Edition – but they have cut the price of my original in half.. I understand that you want your concern about your order for Bayonetta 2 (Nintendo Wii U) sorted out. It’s never our intention to cause inconvenience to valued customer like you. Upon checking your account, I can see that you’ve been a loyal customer of ours for a long time and I’ve escalated your concern with my supervisor and as an exception for you, I’ve adjusted the price of your order from GBP 31.85 to GBP 16.18 which you’ve been given a discount of GBP 15.67 to match the difference of the amount for the special edition. Once your order ships, it will be the only amount that you’ll be paying as we don’t debit money from your payment card until just before your items are dispatched. Your payment card is charged approximately 24 hours after your parcel enters the dispatch process. Once again, I really do apologise for the inconvenience this has caused. I hope this resolution has helped you. We look forward to seeing you again. I’ve had it pre-ordered since July and opened a query just before the Bayonetta Nintendo Direct, as I expected it to shake things up a bit (understatement). I received a reply the day before this mass email went out, which simply states “Our relevant team confirmed that the item you’ve ordered includes Bayonetta 1” – My order page on Amazon still only shows the standard edition, but at least I can argue that I have it in writing now. Never seen such a weird response to something like this from Amazon before. Just checked my order page and appear to have been upgraded to the special edition, my delivery was also changed from super saver to first class. I’m guessing that e-mail that’s supposed to be coming today will inform everyone of this change. Same as above, Order has been upgraded to the Special edition and got a email from Amazon confirming that’s the case. While I’ve not per-ordered Bayonetta 2 as I don’t own a Wii U. I thought I would contribute with a recent experience from Amazon. I was quite unaware Amazon appear to have setup their own courier service Amazon Logistics. I’ve made two separate orders from Amazon recently one for some books and another for a Gamecube controller covered by Prime but from a third party.. The controller never actually arrived I had specified next day delivery. After several days I eventually checked my email and Amazon to discover three attempts had been made to deliver it but all of which were unsuccessful and it had been returned to the supplier. The Amazon order suggested it had been sent out by Amazon logistics so I assumed that was what the delivery note was for. Then I checked the note and the date on the delivery note was for the 23rd of September and I didn’t order the controller until the 24th. The delivery note was clearly for the books. I haven’t as of yet followed this up with Amazon as I’d already chosen to cancel the order before making that discovery.